counter-puncher. As the fight wore on, Gabe's face started to show some lumps and nicks. Still after five rounds, I had the score basically even. So it would come down to the last round. Both guys came out looking to claim the final frame and they waged war. After almost three minutes of frenzied scrapping, it was Onyango who took it. Then to further the point, with just a few seconds to go, Rosado was penalized a point for rabbit-punching which seemed to seal the deal for Onyango. The pro-King crowd groaned, knowing this would prevent any close-decision for their man. In the end, all three judges had the fight for Joshua Onyango by a mile, giving Rosado only one round (59-54). Despite the loss (his second in three fights), Rosado is still a good prospect who simply needs to get back to the gym and keep fighting as often as he can. Onyango, fighting out of Trenton, NJ, is welcome back in Philly anytime. 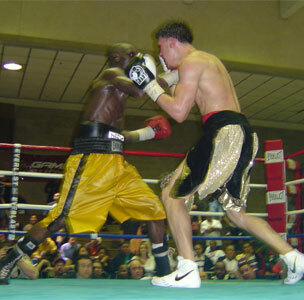 The undercard featured seven other bouts plus one exhibition. Issac Suarez, Philadelphia, opened the show with a four-round unanimous four-round decision over Markel Muhammad of Akron, OH. 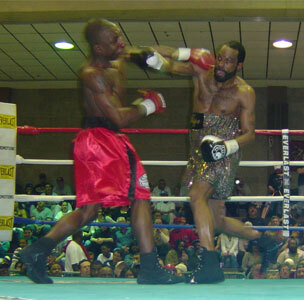 "Big Poppa" Tommie Speller, Philadelphia, won by TKO in round two (2:28) over Michael Rainer, Lumberton, NC. 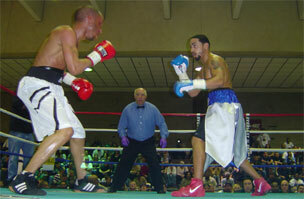 Speller looked good as he ran his young record to 3-0 (3 KO) in the scheduled four rounder. Chandler Durham, Philadelphia, drew with William Scales, Philadelphia, in a four round bout. Seven-foot, 340 pound, "American Giant", Ernest Mazyck, a.k.a. "Zeus", looked anything but a ring-god as he won the unanimous decision over a plucky (read shorter) Adam Smith. The best Smith could do was reach Zeus' shoulder with his wild overhand rights. But it was Smith who pressed the action while Zeus held and glared and landed the occasional punch. It was fun to watch - in way - but let's face it, Zeus is no Primo Carnera - and that's saying something. Lujuan Simon, Philadelphia, pushed his record to 16-0 (5 KO) with a unanimous verdict against William Gill of Tom's River, NJ, in a six-rounder. Following this bout, Tyric Robinson, scratched from the official line up, mixed it up with Henry Lundy in a three-round exhibition. Out-of-towner, Ricky Thompson shocked Victor Vasquez, Philadelphia, by way of first round TKO at 1:42. It was the first loss for Vasquez, now 2-1. Finally, preceding the main event, Tim Johnson made a smashing pro debut with a right hand corker in round two that dropped Derrick Buchanan near the end of the round. 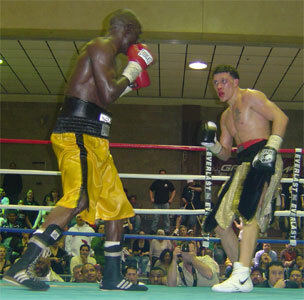 The bout continued, but just 11 seconds into the third round. Approximately 600 attended.